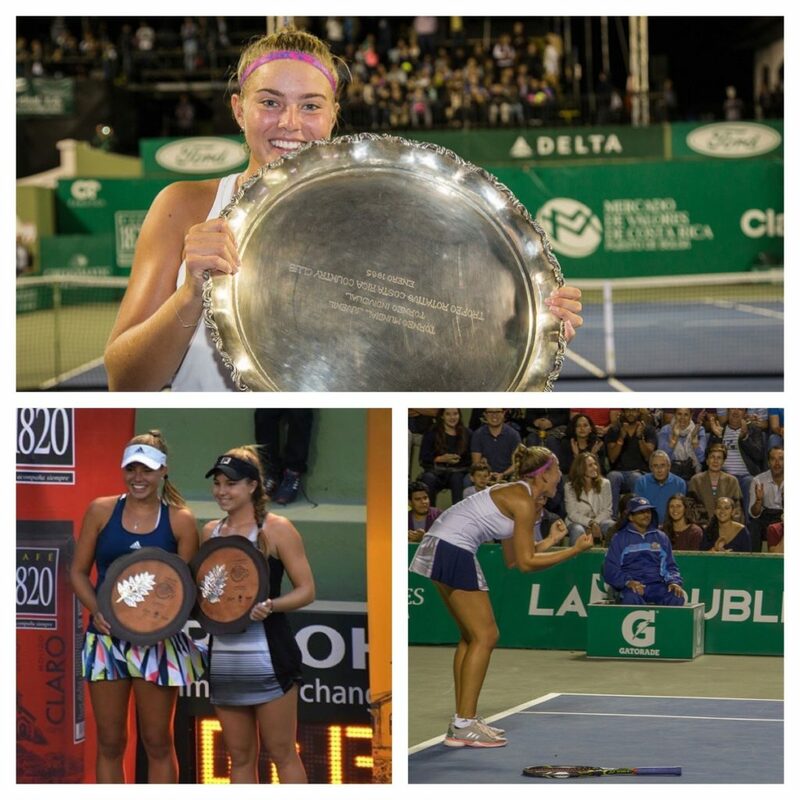 2017 has started well with Emily winning both the singles and doubles titles at the Grade 1 Coffee Bowl tournament in Costa Rica. Playing on the centre court in front of a capacity crowd, Emily showed that she has what it takes to take on the best, to come back from losing the first set (she has done this 7 times already this year) and to enjoy the occasion. A tremendous achievement and a great way to start the New Year. However, this tournament was just a stepping-stone and from Costa Rica, Emily travelled to Australia to play the Grade 1 tournament in Traralgon, two hours east of Melbourne. Here the challenges were different – extreme heat and gusty wind – but Emily managed to continue with her high standard of tennis and successfully reached the quarter finals where she was narrowly beaten 6-7 6-7 by Wang, a very talented (and tall) girl from China. In the doubles, Emily once again teamed up with fellow Brit, Jodie Burrage, and they managed to reach the semi finals where they were overcome by the eventual winners, Swiatek and Chawalinska from Poland. From Traralgon, Emily travelled to Melbourne to play the Australian Open Juniors event – the first Grand Slam of 2017. Emily cruised through her first round match to set up a meeting with Seone Mendez from Australia. A tough match in every respect but having lost the first set, Emily fought back and took the match 4-6 6-3 6-2. This set her up with a match against Yuki Naito of Japan in the last 16. Once again she lost the first set, but managed to fight her way back to win 0-6 6-3 6-3 and so secure a place in the quarterfinals. The quarterfinal match was another tough one – this time against Bianca Andresscu, a Canadian girl who rarely plays junior events and is ranked 294 in the women’s game. Emily fought hard but the experience and power of Andresscu won through. However, to have reached the quarterfinals of her first Grand Slam of the year and to have been the ‘last Brit standing’ was a tremendous achievement for Emily and is a great stepping stone for the next stage of her journey. In the doubles, Emily and Jodie also reached the quarterfinals, losing out to the established pairing of McNally and Subhash from the USA. This month’s achievements have lifted Emily to no 11 in the World Junior rankings – a great place to be and a good platform from which to take on the challenges of the tournaments ahead. Next month sees two more high level junior tournaments then it’s back to the UK for a training block in preparation for a series of Women’s Pro events.